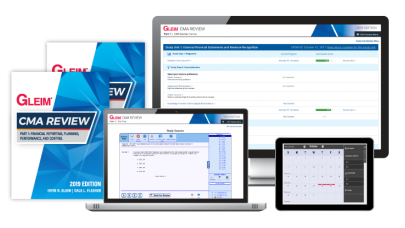 Gleim CMA Traditional Review System includes everything a CMA candidate needs to pass the CMA exam. CMA Review System is available as a set and is also offered for each individual part. You will experience our flexible, easy to follow, three-step study approach, but with less guidance than our Premium CMA Review System. Gleim Online – The majority of your coursework will be completed in this guided, self-study review. Gleim Online includes your interactive study planner, exam-emulating quizzes, the Gleim digital book containing comprehensive outlines and examples, additional Essays, and Audio Lectures. You will also have access to your own mentor, a Personal Counselor who will offer advice and assistance while you're studying for the exam.